The original Dillon Pro Vee, designed and built in the winter of 2007/2008, won eight races in 2008 and 2009, only finished off the podium once, and won the GT Pro Highpoints Championship both years. The Pro Vee consistently has been the fastest boat in GT Pro. 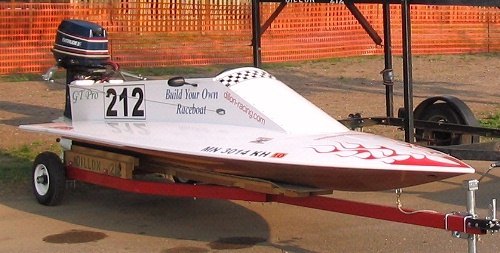 The Pro Vee is a 12' 7" long v-bottom racing boat specifically designed for the APBA Sportman class called GT Pro. 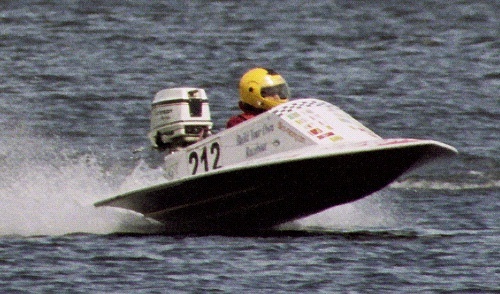 This class is raced in Minnesota and surrounding states, in races organized by the Twin City Powerboat Association. The Pro Vee was born of a desire to improve on the basic v-bottom profile that I used for my (very successful) Mini Vee. I took as inspiration a family of boats -- from Allison, Critchfield, Lee Craft, Rapid Craft, and others -- which share the same bottom shape. The Pro Vee has that same basic bottom profile, though it bears little resemblance otherwise. While the above mentioned boats are substantial and relatively heavy and can accomodate as much as 75 hp, the Pro Vee was specifically designed for the 35 hp OMC motors used in GT Pro racing. The result is a boat that rides softer and is more stable in rough water than the Mini Vee. With a 35 hp Johnson or Evinrude motor, equipped with an off-the-shelf OMC propeller (somewhat modified), the Pro Vee has attained speeds near 47 mph . I am currently experimenting with a larger diameter prop and aiming for a top speed at or near 50 mph. Due to it's complex bottom shape, the Pro Vee presents some challenges to the boatbuilder. Less experienced builders might want to opt for the Mini Vee. satisfied. The gps speed was 57.9 mph. The boat ran smooth and turned great." The evolution of the Pro Vee was not without some difficulties. Initial testing revealed a boat prone to severe porpoising and chinewalk. Shifting weight forward dampened these tendancies, and that is how we entered the racing season. After six races the Pro Vee had only one win, but lead in points. With no races scheduled for August, I used the time off to do some transom surgery (see my original online reports). The success of this change allowed me to move some weight aft again. Also during this period, I refinished the bottom and dropped down to a smaller carburetor jet. These improvements boosted my top speed by three mph which lead to two more victories at the end of the racing season. The Dillon Pro Vee boat was designed with the 31.8 cubic inch Johnson or Evinrude in mind. This two-stroke, two-cylinder motor was manufactured in 20, 25, 30 and 35 horsepower versions from 1976 through 2005. It is the 35 horsepower model that we use in GT Pro. If you do not intend to race your boat, I do not recommend using an engine that exceeds a weight of 130 lbs. 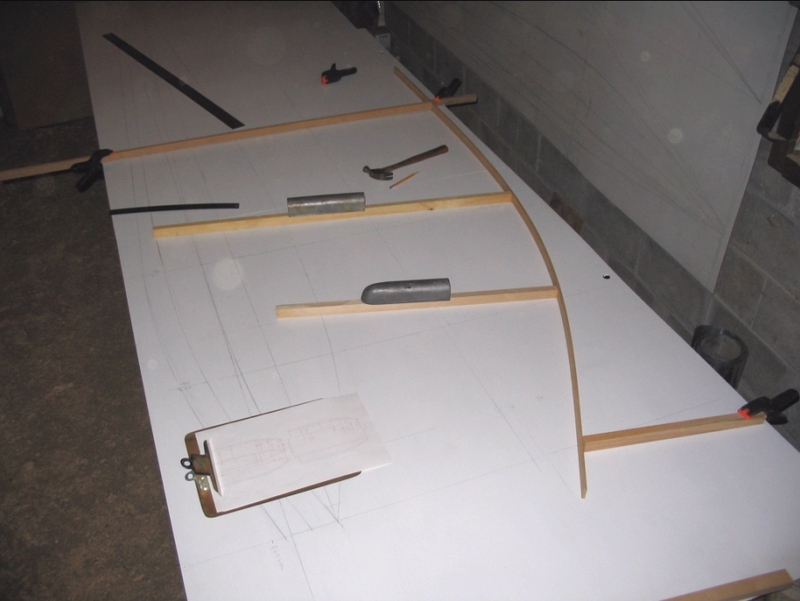 The plans package, available via direct download or by postal mail, includes thirteen measured drawings; a scantling list; and some notes on wood, hardware and other materials needed to complete your boat and set it up for recreational boating or sanctioned racing. Also, I provide extensive online construction notes, including dozens of photos, which will guide you through the entire building process. And, I will be just an email away if you have questions. The plans package is $45 US via direct download; or $55 printed on 8.5" x 14" sheets and sent via postal mail. You can pay online through Paypal (you do not need a Paypal account), or you may send a check or money order.